Everyday, Payless sends me an email advertisement. 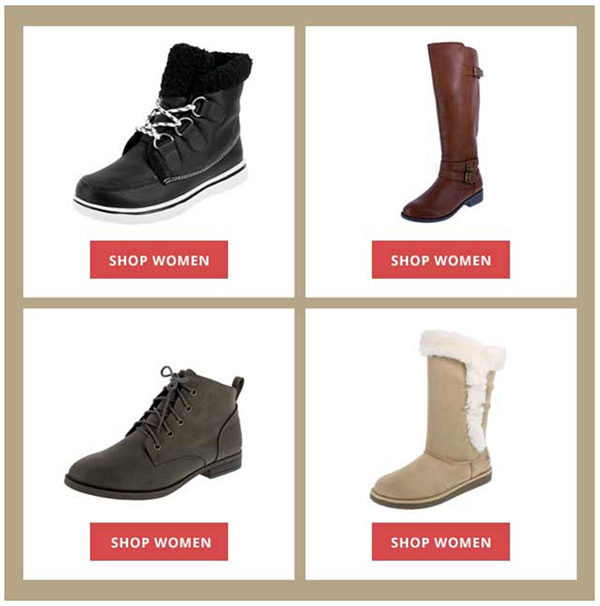 Wednesday's ad contained the following image of footwear for sale at their store. Notice that the images were clearly labeled "SHOP WOMEN" so customers would not mistaken the practical, virile ladies' styles as men's footwear. I wonder when my daily Payless missives will contain an image like the following — footwear for sale at their stores clearly labeled "SHOP MEN" so customers would not mistaken the impractical, dainty gentlemen's styles as women's footwear. Michal Rudas femulates Shania Twain singing my theme song Man! I Feel Like A Woman on a 2016 episode of Polish television's Your Face Sounds Familiar (Twoja Twarz Brzmi Znajomo). If only... I bought a pair of Aerosoles mid heel pumps for my Halloween day. My size is 10.5 wide. They're a bit too tight. I was glad that I brought my sandals because after 5 hours, my right heel had rubbed raw. I'll have to stretch the new shoes.